I bought a Vita at launch, something I don’t normally do. The Vita though I have absolute faith in and I love it. 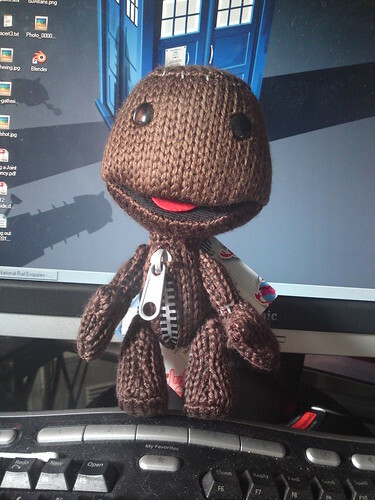 Also, the news that there was going to be a Little Big Planet for the Vita, made me do a little happy dance. We’re getting closer and closer to its release and I’m so excited. For anyone unaware or anyone who’s anxiously waiting like me, here’s a making of video for you. It makes me really excited to watch this. I cannot wait to have this game in my hands. There really was no way I was going to resist this when our own PuffyTail posted a link to it on Twitter. Yes I paid way too much for shipping from the US to the UK, but it did get here in 4 days and that includes the weekend. I’ve been waiting for this little guy forever and finally he’s here and all mine. I really don’t have much to share. I just wanted to share my joy at getting him today. You can buy one of your own here.